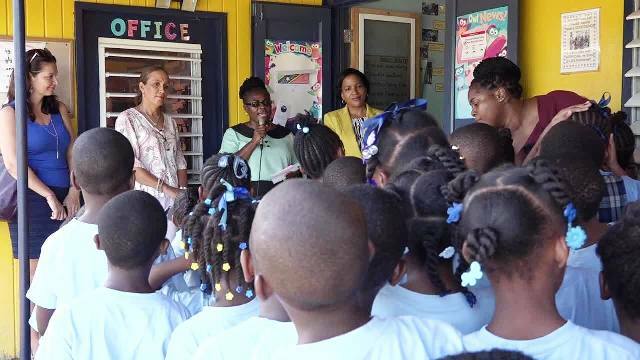 NIA CHARLESTOWN NEVIS (October 20, 2016) — The Maude Crosse Preparatory School became the first school in St. Kitts and Nevis, to make a contribution to the Paediatric Assistance League of St. Kitts and Nevis (PALS), a non-profit organisation. It has been providing assistance for over 20 years, to less fortunate children in the Federation who need urgent medical care overseas. The school handed over $200, the proceeds of a coin drive, to the organisation’s President Giselle Matthews and Treasurer Carolyn Chisholm during a school assembly on October 18, 2016. In response to the donation, Matthews thanked the students for assisting other children in the Federation. She told them they were role models worthy of emulating and encouraged other schools to follow their lead. “We wanted to say thank you very much for making this donation to other children because this money goes to help other children in St. Kitts and Nevis who need assistance medically…I think your school is a very good role model for other schools on Nevis and St. Kitts, to show what a few coins can do. “All the pennies add up. So hopefully, you will be a good role model and other schools can follow your lead and start to raise money for various charities, by giving the coins that we take for granted, that are often just left on the counter at home or in our pockets or purses and they can come in very handy to help others in need [and] those who are less fortunate,” she said. 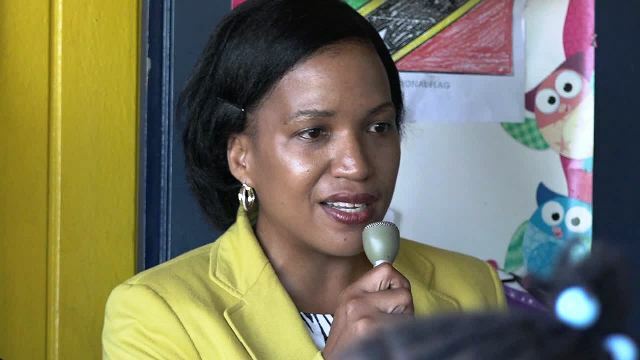 Matthews, also acknowledged Permanent Secretary in the Ministry of Health Nicole Slack-Liburd of her hand in introducing the coin drive to the school and pursuing the project. Liburd, who was also present noted that the Ministry on its own, could not provide overseas medical assistance for children in need and continues to partner with the Paediatric Assistance League and the World Paediatric Project. She applauded the students, parents and staff for their commitment and the success of the coin drive and urged them to continue to support the cause. “You are our first partner and we hope for you to be a partner going forward. So I want to thank you once again, all the staff, teachers and the parents who continue to donate,” she said. 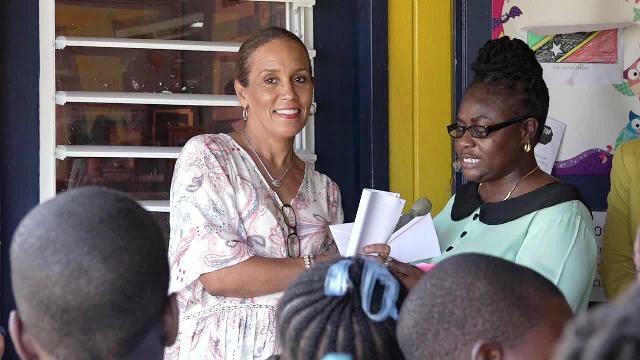 Meantime, while handing over the donation, the school’s principal Cherry-Anne Walwyn, stated that the coin drive was undertaken over the last school term. She said and the students went above and beyond to giving more than the one and two cents that were required and in most cases they gave five, 10 and 25 cents and in some cases one dollar coins, thus making the donation possible. The Coin Drive is also being conducted at Harpers book store in St. Kitts. Also present was Jaqueline Brown King, Director of World Paediatric Project in the Eastern Caribbean.